The Ross UV Protection Rash Guard top has a cute Mr.Crabby on the front with loads of mini ones emblazoned on the arms. 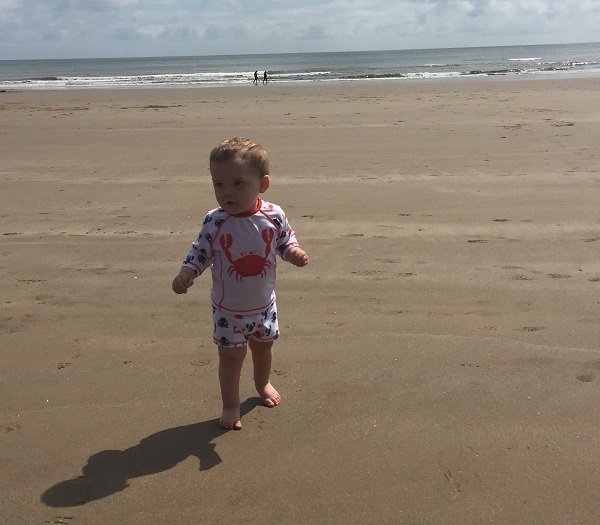 Giving UPF 50+ UV protection, it protects from the suns rays whilst your little one is playing out and about, keeping little arms, tums and shoulders covered. I think this is so important when out and about on a warm day as, even though it might not feel that warm to us, the suns rays can be really strong and children, especially babies, are effected first with their soft skin. The Ross UV Protection Rash Guard pairs up with the Nigel Swim Shorts which also comes with the all over sealife print to match. The bright red trim just makes them even more bright and they look so summery on. When it comes to the material, it is super soft, stretchy and clings to the body to stop it rising up when padding, keeping the little ones protected, even in the water, I like that it comes as a 2 piece set rather than an all-in-one as it means that it is easier to get on and off when needed, especially for nappy changes. 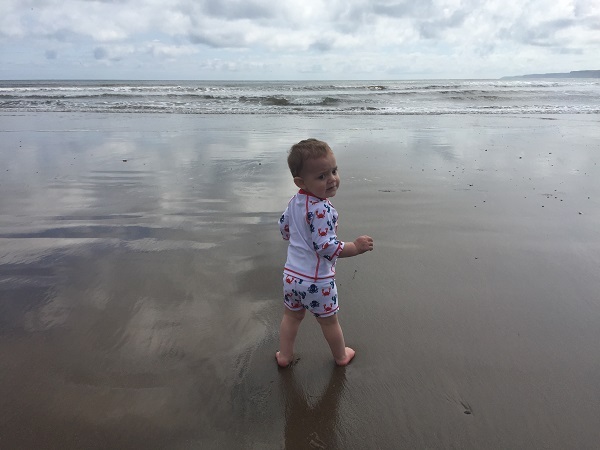 When we left the beach, Joseph still enjoyed walking around, toddling about and finding things that he can play with so we took this super cute pair of Citrouille et Compagnie Frinoui sandals with us for Joseph to wear. 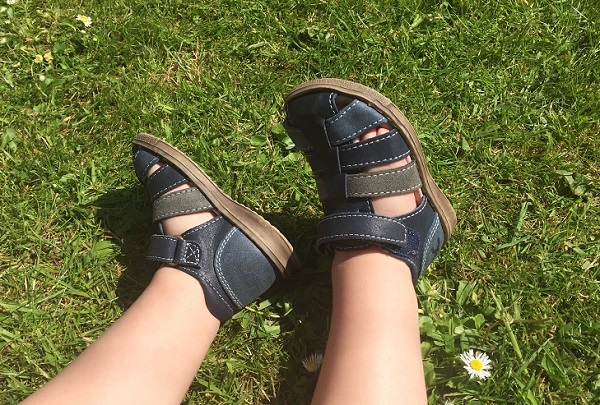 So not only could he wear his own little super comfortable sandals, but he looked stylish in them too and it meant that they kept his little feet cool and not closed in on the warm days out. 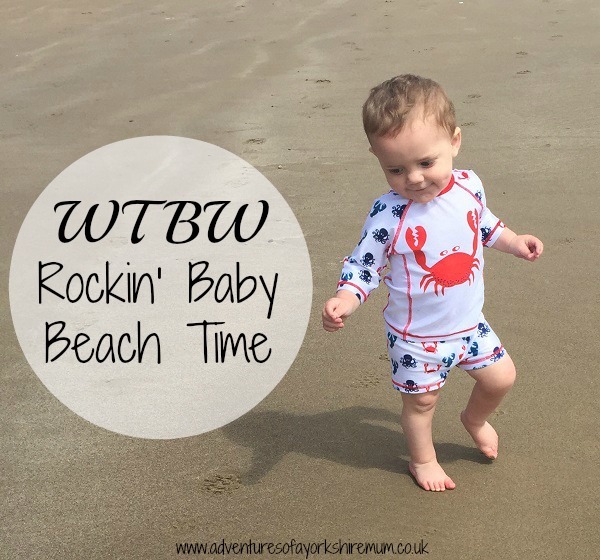 Super fun designs are always a big plus when it comes to baby clothing and Rockin' Baby always offer great designs and I love that, for every piece of clothing they sell, they also donate a piece to children in need. OOh I have been looking for some new swimwear for my 4 year old ... these are gorgeous. Off to see if they go up to her size!! What a gorgeous wee playset, love the photos. You've a great wee model there!!!! Lovely pics and lovely clothing. I also worry about children getting burnt in the sun so welcome clothing ranges such as these. Now if only someone would come up with suitable sun protection products for pets. Sounds silly but they get sunburnt, too.